These weekly blogs are entries for my own records (so may not be very exciting!). I was apprehensive after last week’s training and was wondering what we would have to do this week. Freda explained on arrival that the water was still too cold to start doing longer swims. Swim 1 was 40 minutes for the majority of us, but the more acclimatised swimmers or those swimming earlier in the season were asked to swim for up to an hour. I felt very cold when I got in, but soon got myself going and managed the 40 minute swim quite comfortably. We then had 90 minutes to warm up before we were asked to do the same again. Again, it felt very cold when getting in, but I managed the 40 minute swim with no real problems. Kate and I mis-timed it and were up by the Prince of Wales pier when the 40 minutes were up, so we actually swam for 48 minutes. Still finding my bearings in the harbour! 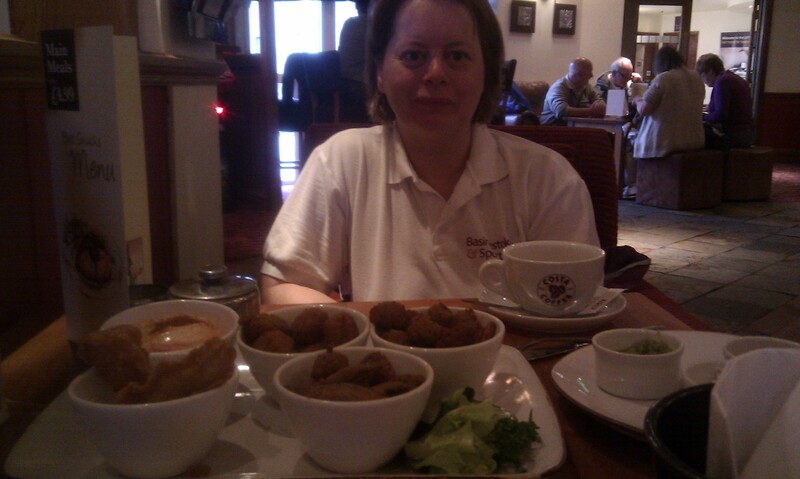 Kate and I had lunch at the White Horse in Dover. I had fish and chips. We then went for a walk along the sea front and I had a 99 flake from the ice cream van! I looked out of my hotel window and it was sunny and the sea looked calm. It looked really inviting. Today we were asked to swim for 45 minutes, then we had 90 minutes to warm up, then a 60 minute swim. The 45 minute swim wasn’t too pleasant. After about 25 minutes I felt really cold. That was weird as the sun was out and I had done two very comfortable 40 minute swims the previous day. I managed the remaining 20 minutes but had the shakes when I got out. I never get the shakes! I walked to the Premier Inn and back and got chatting to some of the other swimmers, who said that exactly the same thing had happened to them – they had got really cold quite soon into the swim. Perhaps we still hadn’t warmed up from the previous day. I said that I felt too cold and had done enough and wanted to go home! I didn’t think I would manage 20 minutes and I knew that the next swim would be at least 45 minutes. Anyway, by the time I had walked back to the beach I was feeling warm and quite happy to swim again. I got in for the 60 minute swim and felt wonderful in the water. I was really enjoying my swim and didn’t want to get out. It was a case of “mind over matter”. 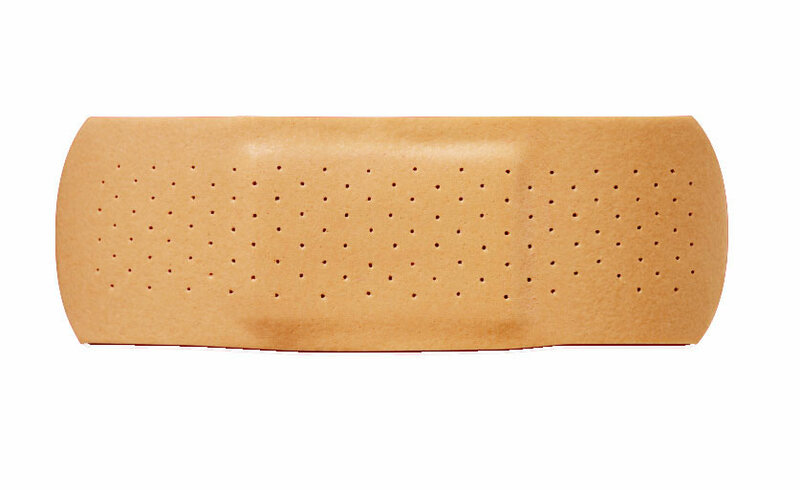 Once I was in the water and swimming, everything was fine. I could so easily have talked myself out of getting back in again, but I did exactly the opposite. I’m not sure what the temperature was this weekend. Sandettie was reading 10.5C on Saturday and 10.6C on Sunday. Kevin Murphy’s watch gave a reading of 11.1C on Saturday. I don’t suppose the temperature really matters. It was COLD and all good Channel training! The Dover training season is finally here! I collected my friend, Kate Robarts, from Basingstoke at 7:15am and we headed to Dover Harbour for the first training session of the season. After registering as soloists for the season, we got changed and ready for Freda’s briefing at 9:55am. It was a horrible, grey day and the sea was quite lumpy. It didn’t look at all inviting and I didn’t want to get in. I had done a bit of research beforehand and read other swimmers’ accounts of Dover training. My expectation was that we would do two short swims of 25-35 minutes. We were told that the first swim was an hour(! ), but for swimmers who were not used to the cold it was half an hour. I asked Freda and she told me to do half an hour as I am not used to swimming in the cold (15C in Gozo isn’t “cold”). It took a while for me to get in, because it felt painfully chilly. It’s a really strange situation to be in – your body is telling you it’s too cold, your brain is saying that the sensible thing is to walk back up the beach and get dressed, but the over-riding part of your mind just wants to get in and swim. After a couple of minutes a wave knocked me over anyway, so that helped matters enormously. My first swim was 35 minutes and I had to get out then as I couldn’t feel my hands or feet and was a bit worried about how I would feel afterwards. I still couldn’t feel my feet at 12:30 when it was time for the second swim. Again, we were told that the swim was “up to an hour” but to do our own risk assessment. I managed 30 minutes. When I got out Kevin Murphy said to me that the water temperature was 9.3C. No wonder I only lasted 35 and 30 minutes! I was very pleased with my first two swims of the season. The instruction was the same as yesterday. Soloists were to swim for up to one hour, but again to come out of the water when ready. I managed 40 minutes before I started to feel a bit light headed and headed to the safety of the beach. But good progress on yesterday! Freda said that there was no second swim today as it was just too cold for two swims. I was pleased with that decision as I was still struggling to hold my cup of tea an hour after I got out. However, for eight others the temptation was too great. They went back in for a second swim. I was sensible and watched from the beach! Again, the soloists were asked to swim for up to one hour, but to conduct our own risk assessment and to stop when we felt ready. The sea was nice and calm today and it actually looked quite inviting. It wasn’t quite as inviting as soon as I put a foot in the water though! I wanted to do an hour but I managed about 50 minutes before deciding that was enough. I actually felt reasonably OK in the water and at the time I thought that I could have stayed in longer. However, I experienced quite a “drop” when I got out and was acting a little confused. I was glad that I got out when I did. I was still shaking 2 hours later! I am sure that I will manage the hour next weekend. Myself and a clubmate from Basingstoke Bluefins Masters, Neil Mitchell, had arranged with the Aquadrome staff beforehand to share a lane. Neil and I had one side of the lane each. Much to my embarrassment, a couple of other chaps from the club turned up with stopwatches to pace Neil. He was hoping to do 74 minutes, I was hoping for under 1h35m. My previous PB for the Swimathon was 1h34m. Anyway, Neil went off like a rocket and held that pace. I held my usual “steady” pace. Neil finished in 1:12:27. I finished in 1:31:00. 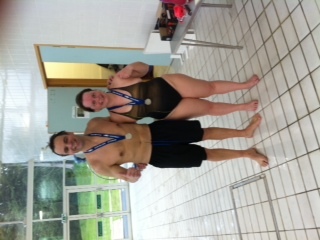 Both of us were delighted with our times (although I am convinced I did 202 lengths). I thought I was a lot slower with all the distance work I have been putting in over the winter, but I’m doing just fine. That’s good news for this summer! On the Sunday night I entered the team 5K event with my two children (8 and 11) and my husband. It was great fun. We had a lane to ourselves. My daughter swam a beautiful 26 lengths breaststroke. My son swam 88 lengths front crawl, stopped and said “You can’t beat me now, Mum” and did 1 more length front crawl and his last length butterfly. My husband was feeling ill and unfortunately had to stop after 6 lengths. I did the last 78 lengths. We finished in 1 hour 59 minutes and 19 seconds. Woohoo! At the end of my previous post I mentioned that the Dover training season was about to start, with the first training session scheduled for Saturday 28th April. My bags were all packed on the Friday night and I was ready to go, when I received an copy of an email from Freda confirming that the weather forecast was diabolical and that Dover training would now start the following weekend. Phew! I had seen the weather forecast and it was hideous. I know it’s not the correct attitude, but I was rather pleased that it was cancelled! As soon as I heard that Dover training was cancelled, I booked myself a ticket to go to the H2Open Day on Saturday at the Reading Lake hotel. Given that the venue is only six miles from my home and is my local training lake, it probably should have been Plan A anyway! It was a good afternoon out. There were plenty of exhibitors and lots of lovely people from the open water swimming community to speak to. I went to three seminars. The first one was Colin Hill speaking about the 10K marathon swims for the London Olympics. The final talk I went to was Nick Adams, President of the CS&PF who gave a very interesting insight about what it takes to become a long distance swimmer. I have a huge amount of respect for these three gentlemen. All have swum the English Channel and anyone who has swum the English Channel is a hero in my book! The lake was open all afternoon if anyone fancied a swim. It was wet, miserable and completely uninviting. Instead I spent the rest of the afternoon sampling Greek food at The Big Blue’s stand. I had to dash off at 4:30 as I remembered I had entered the Swimathon in Basingtoke at 5:30.